The cryptocurrency market has returned over 900% since the beginning of 2017 (at the time of writing this). You cannot find these kinds of return on investments in the stock market or anywhere. If you had made an investment of $500 in January, you would have made $5000 in less than a year (!). This type of strategy is known as long-term investing, and this guide is aiming to show you how to implement this investment method – to construct a long-term cryptocurrency portfolio. Long-term investing is simply as its name says – taking a long-term view of investments. Everyone defines ‘long-term’ differently. In the stock market, ‘long-term’ normally means anything that lasts years… However, given the fact that the cryptocurrency market moves extremely quickly, we can scale that number down to couple of months or a year. If we look at stock market investment, the legendary investor, Warren Buffet, is an advocate of long-term investment because of the many advantages it has to offer. Historical statistical data of a growing economy has proven that it works: Looking at the S&P 500 over a 5-year period, it has achieved a return of around 60%. The same can be said for the FTSE 100, which achieved a return of 25% over the same time period. Markets generally tend to trend upwards over a period of time, so with this in mind, long-term investing does have its merits. This can be said not only about the last 5 years, but for almost every 5 years throughout the history of the new economy. Lower fees: If you take an active trading approach to investing, then it is expected that fees from exchanges will trim your profits. With a long-term investment strategy, all the investor has to do is select a few cryptocurrencies, and then wait. A long-term investor does not trade every day, therefore, they do not have to worry about trading fees. Less risky: Dipping in and out of the market could mean that you miss days in which significant gains are made. You don’t have to worry about this with a long-term investment strategy. Keeping in mind that fact, in order to reduce volatility, we recommend getting into the market using the DCA method. Now that the benefits of a long term-investment strategy have been made clear, it is also important to consider which cryptocurrencies you want in your long-term portfolio, or how to build your portfolio. Before that, let’s identify some indicators that we can use to measure the potential of the crypto project in the long term. These are just a few indicators that we have identified; feel free to include yours in the comments section below. 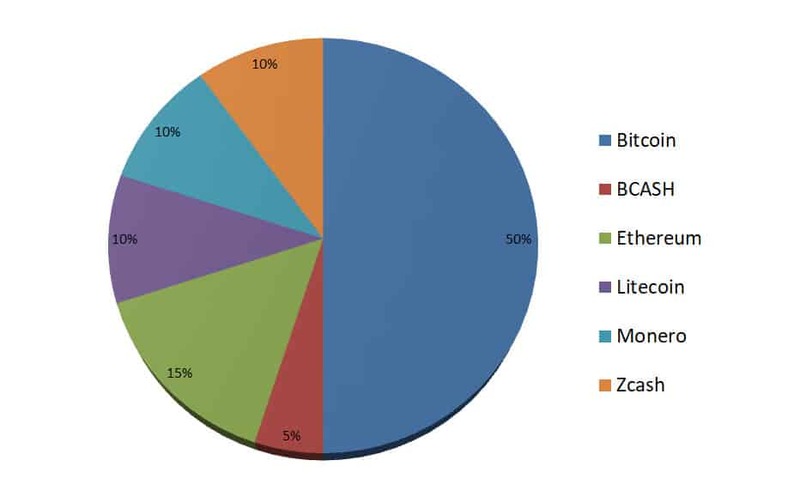 Market share: this can be defined as the proportion of market capitalization that a cryptocurrency has. A large market share typically indicates dominance. For example, Bitcoin’s market share is currently 60% (at the time of writing) of total market capitalization of the cryptocurrency space. We can use this as an indicator to determine the long-term viability of cryptocurrencies, including Bitcoin, in our portfolio. Utility value: when determining if a cryptocurrency will be here in a few years from now, we have to ask ourselves, is the cryptocurrency useful? Does it have a users’ market? This question is important because it is the most useful cryptocurrencies that are likely to be widely adopted. Take Ethereum for example, its utility value derives from its function of allowing developers to build Decentralized Applications (DApps) on top of its blockchain. We can conclude that, as long as Ethereum is the go-to-place for DApp development, it is likely to maintain, and possibly increase, its utility value. Therefore, Ethereum would be a viable cryptocurrency to include in our portfolio. Transaction volume: in order to determine whether a cryptocurrency is actually being used, you can take a look at its transaction volume. In the case of Ethereum, its transaction volume per day is about 500,000 ETH. Historically, this is a number that is increasing and as long as this upward trend continues this reaffirms the long-term viability of holding Ethereum in our portfolio. Technology development: this is a key aspect in cryptocurrency. If the technology behind a cryptocurrency is not fit for purpose, then it is likely that in the long-term, the cryptocurrency will fail. An example of a positive technological development is Ethereum’s recent Byzantium hard fork. This hard fork allowed for more transactions to be processed on the Ethereum blockchain. This positive technological development increases the likelihood of Ethereum being widely adopted, and so once again makes it a viable candidate for our portfolio. Market news: it can emerge that a cryptocurrency is having a problem, and depending on what that problem is, it can significantly affect its long-term viability. Market news will affect the price of your cryptocurrency, and the value of your portfolio, so it is imperative that you are ready to react. As well as market news, other factors can also affect the price of cryptocurrency, which can be found here. Overall, it is important to stay up-to-date with market news involving cryptocurrencies in your portfolio, so that you can make informed investment decisions. These are just some indicators that you can use to determine the long-term viability of a cryptocurrency. With this in mind, we can now turn to portfolio construction, more specifically, what percentage of each cryptocurrency we should hold in our portfolio. Exposure to a particular cryptocurrency is primarily dependent on your risk appetite. This can be defined simply as, your tolerance towards taking risk. Using traditional investment markets as an example, if your tolerance towards risk is neutral, then a typical investment portfolio would be 50% equities and 50% bonds. Equities are known to be riskier than bonds, but also offer higher returns as a result. Conversely, bonds tend to be a safer asset than stocks, but offer a lower return over time as a result. Combined together, a balanced portfolio is produced, not too much risk, but also not too safe. If we apply this to cryptocurrency, we can draw some parallels between the traditional markets and the cryptocurrency market. One would typically regard Bitcoin as being less risky than an unknown altcoin. From this, we can then tailor our level of exposure to suit our risk appetite. For example, a very risky portfolio might be 80% in small-cap cryptocurrency and 20% in Bitcoin. Using the information we have gathered so far, we can now construct our own long-term portfolio. DISCLAIMER: Recommendations and Information found on Cryptopotato are those of writers quoted. It does not represent the opinions of Cryptopotato on whether to buy, sell or hold any investments. Investors should be cautious about any recommendations given. All investors are advised to conduct their own independent research into individual coins before making a purchase decision. Use information at your own risk. Our portfolio will be different to yours because factors such as our risk appetite will undoubtedly differ. Our portfolio has been closely modelled using the scheme below. You can use it too when constructing your own long-term cryptocurrency portfolio. Bitcoin (50%) – When speaking about cryptocurrencies, it means speaking of Bitcoin. Bitcoin is the base asset for the other alternative coins, and is the primary decentralized crypto currency. Bitcoin was created by Satoshi Nakamoto back in 2009. Bitcoin is designed to function just like physical currency, which transfers value, and as time goes on more places accept Bitcoin as a legitimate way of payment. Because we believe the cryptocurrency market to be quite volatile, having a defensive portfolio to counter that volatility is good. 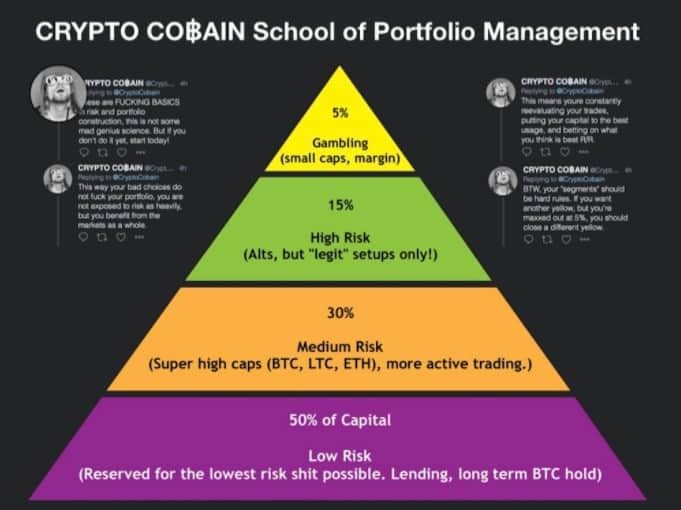 50% of my portfolio is low risk (compared to crypto risk management), which means that it will be holding Bitcoin for the long term, because it has a lot of longevity. It is the oldest cryptocurrency in the space, and is the first coin that newcomers are likely to invest in because of the exposure it regularly gets in the press. Bitcoin Cash (5%) – Bitcoin Cash is similar to Bitcoin in that it too is supposed to be a currency that is dedicated to serving as a medium for the purchase of various goods and services. The key difference between Bitcoin Cash and Bitcoin is that the former has an 8MB block size, whereas Bitcoin has a 1MB block size. A bigger block size allows Bitcoin Cash to process transactions faster than Bitcoin, and at a lower fee. Looking at the price movements of Bitcoin Cash and Bitcoin, they are uncorrelated, so when the price of Bitcoin moves upwards, the price of Bitcoin Cash tends to dip even more, and vice versa. This strategy means that we can offset the risk of any adverse price movements in our portfolio. Ethereum (15%) – Ethereum is different to Bitcoin in that its sole purpose is not to be used as a medium of value exchange. Instead, Ethereum allows developers to build dApps using smart contracts. The tradeable currency of the Ethereum project is known as Ether. Litecoin (10%) – Litecoin is often marketed as being the silver to Bitcoin’s gold status. Being a hard fork of Bitcoin, Litecoin shares many similarities to the original coin; Litecoin can also be used as a value exchange coin. However, Litecoin’s block generation time of 2.5 minutes, compared to Bitcoin’s 10 minutes, and different hashing algorithm (Scrypt), are features designed to produce a more innovative blockchain and cryptocurrency. Monero (10%) – Monero is similar to Bitcoin in that it allows value exchange. However, Monero differs from Bitcoin in that it is focused on providing greater privacy to those that utilize their blockchain, using their stealth address mechanism. Anonymity is likely to become more and more important in a world where Bitcoin addresses can be traced. As more regulation starts entering the cryptocurrency space, an increasing number of individuals will gravitate towards privacy coins such as Monero, Zcash and Dash, that can mask their transaction activities. Zcash (10%) – Like Monero, Zcash is a privacy coin that is focused on ensuring that user anonymity is well protected when transactions occur on the network. Zcash does this by leveraging its zero-knowledge proof constructions known as zk-Snarks, which allows users to exchange information without revealing their identities. Investing in the cryptocurrency market is exhilarating, but it is also important to make sure your cryptocurrency is secure; there are too many stories of cryptocurrency funds being stolen because of lax security. Hardware wallets are the best way to protect your cryptocurrency, and this article provides more information on hardware wallets and how you can get secured. It is an exciting time to get involved in cryptocurrency investing. It is a new asset class that is currently delivering better returns than the traditional markets (as of writing these lines). However, it is also important to have a strategy. Not having an investment plan for cryptocurrency investing, or any other market for that matter, can result in heavy loss of your funds. A long-term investment approach is just one strategy that you can choose to adopt. You can even vary the long-term investment approach to suit your own style. The most important thing is to have a plan for each scenario that might happen.